On July 19, 2013, NASA's Cassini spacecraft skidded into Saturn's shadow and rotated to take images of the planet including seven of its moons, its innermost rings and also , in the background, our Earth. Through the sun's influential and actually destructive rays eclipsed by Saturn itself, cameras on board Cassini spacecraft were able to take benefit of this exclusive observing geometry. 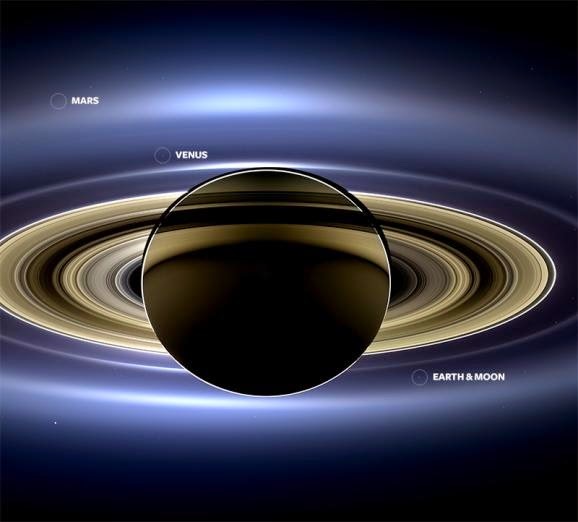 They attained a panoramic variety of the Saturn system that lets researchers to see facts in the rings and all over the system as they are backlit by the sun. This mosaic is unusual as it symbols the third time our home planet was captured in an image from the outer solar system.